6 or Category 5e performance of center tuned connector technology. 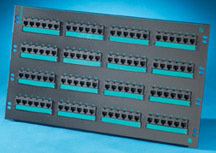 These 110 termination 19” panels are available in six-port and eight-port module groupings, in 12, 24, 48, and 96-port sizes. Panels provide extensive designation abilities, icon compatibility and rear cable management.